Buxton is the Bath of the north. It's warm springs were appreciated by the Romans who called the place Aquae Arnmetiae. Much later Elizabethan courtiers made the hazardous journey to bathe in and drink the local water. Buxton today is one of Derbyshire's main holiday resorts and, indeed, one of the main inland resorts in the country, renowned for interesting and invigorating holidays. From its spa era, the town has inherited many hotels and guest houses, which, added to its ideal position, making it a natural centre for exploring and enjoying the countryside, including over 500 square miles of National Park which surround it. 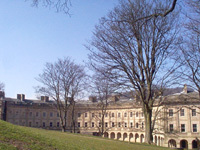 Buxton has a yearly festival mainly involving music and is internationally renowned. The festival is held in July. Also in addition to the festival is the Well Dressing Festival and is usually held during the second week of July.